Galaktoboureko, (pr. 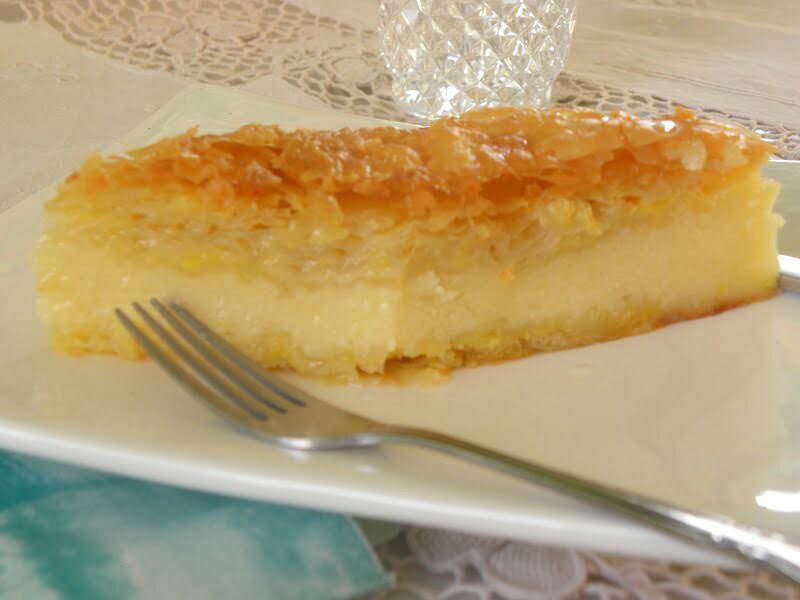 ga-lahk-to-BOO-reh-koh), also written Galatoboureko, is a traditional Greek dessert, possibly the king of sweets for many in Greece and the one I prefer the most. It is made with layers of golden brown crispy phyllo. Each phyllo is brushed with local ewes’ and goat butter or in case you cannot find any, clarified butter can also be used. In the middle theree is a semolina pudding made from semolina, flavoured with vanila and lemon. The remaining phyllos are layered on top and when the dessert is baked a sugar syrup is added on top. It’s one of my favourite desserts and if I didn’t mind the calories, I could eat this for breakfast, lunch and dinner and not want anything else. Nowadays it’s much easier to make galaktomboureko or other recipes using store bought phyllo, because it’s much easier. You can also make individual ones, wrapped in a roll. To make the rolls, cut the phyllo sheets in the middle, from the narrow side. Brush the phyllo with some butter. Add about two to three spoonfuls of cream, 4 – 6 cm below the edge and fold one of the sides on top of the cream, then fold the other side and then fold the remaining to form a roll. Place them in a baking tray, next to the other and bake until golden. What kind of Butter do I use? Traditionally, galaktoboureko is made with fresh ewes’milk butter, which gives a distinct and rich flavour to the dessert. Seee my recipe Ivy’s Lemony Galaktoboureko. We can, however, use cows’milk butter, which must be clarified before using. The reason we clarify the butter, is that it can reach a much higher smoke point than regular butter. This is the main reason we use it to make savory pies or desserts, so that the phyllos do not burn. What kind of phyllo should I use? In Greece we have many types of phyllo but to make desserts we usually use two types. One is called “phyllo kroustas”, which means crusty phyllo, similar to “filo dough” sold abroad and the other one is called “Vyritou”, which litterally means Beirut type, which has eggs in it and it is thinner than phyllo kroustas. Any type of phyllo you choose to use, each sheet must be well buttered. The addition of butter on each one will prevent them from sticking to each other, will help them bake but will also add flavour to the dessert. The phyllos must be layered in such a way, so that they overhang from the baking tin. After the filling is added, they are folded one by one, on top of the filling. This way the filling is sealed inside and not oozing from the sides. Those pieces which are in the corners or the sides of the baking pan are the best because they have more phyll on them! When we finish adding the layers on top, we lightly scare the pieces but without reaching the cream. This way it will allow steam to come out and when baked the pieces will be cut easily, without cracking. At the end we sprinkle a few drops of water on top. This will make the phyllo much crispier. Note: These tips apply when making any other recipe, using store bought or homemade phyllo. A custard, similar to pastry cream is made with ewes’ or cows’ milk and thickened with fine semolina. The semolina gives the cream its texture, which is kind of granular. Note: From what I have read, Norther American semolina is much coarser than Greek semolina. In that case, if you cannot find Greek or other European semolina, you can whiz it in a blender or use corn flour (starch), instead. The texture may differ a bit but it is still very good. Galaktoboureko is usually flavoured with vanilla and lemon zest. The syrup has to be made first, so that it may cool by the time the dessert is ready. It is a very simple sugar syrup, which is flavoured with cinnamon, cloves and lemon peel. After it boils for five minutes, we add lemon juice. This will give additional lemony flavour to the dessert but it is also necessary, so that the sugar will not crystalize again. You can watch a video here. As soon as the dessert is out of the oven, we add the syrup, which must be cold by that time of lukewarm. We let it stand for at least two hours in order to absorb the syrup but also for the cream to set, before cutting it into pieces. A similar recipe as well as many more Greek recipes are included in my cookbook Mint, Cinnamon & Blossom Water, Flavours of Cyprus, Kopiaste as well as in my e-cookbook Volume 2. Galaktoboureko is a traditional Greek dessert made with a custard in a crispy phyllo pastry shell. Begin by preparing the syrup first as it has to be cold or at least lukewarm, when pouring it over the galaktoboureko when baked: Put the sugar, water, lemon peel and the spices in a saucepan. Bring to a boil and simmer for 5 minutes. Mix in lemon juice and remove from the heat. Prepare the filling: Heat the milk reserving about half a cup cold milk to add to mixture. In another pot add the semolina, the eggs, sugar and the cold milk and stir well with a balloon whisk. When the milk is hot pour to mixture stirring continuously. Put on the heat and mix constantly until cream sets. Add the butter and vanilla and stir. Cover the surface with cling film and set aside for a while to cool. Assembling the dessert: Grease a baking pan (25 x 17.5 cm – 10 x 7 inches) with butter. Layer four sheets of phyllo, brushing each one with butter and place them alternating from horizontally to vertically, part of it covering the sides of the baking tin. Add the cream and then start folding the protruding edges, one layer at a time, brushing them with butter. Brush the remaining two phyllos with butter and fold them in the middle. Add them on top and cut the protruding phyllos around the edge of the baking tin. Using the brush tuck the sides to go inside. Brush the last one with butter and score lightly until the knife reaches the level of the cream. Wet your hands with water and sprinkle a few drops on top. Repeat once more. Bake in a preheated oven to 170οC / 338oF for about 35 minutes for about 45 minutes (If baked in a fan-forced oven bake to 160oC/320oF) or until golden on top. Remove galaktoboureko from the oven and add the syrup gradually with a spoon to wet it. It may seem that the syrup is too much but it will soon be absorbed. Set aside to cool completely before serving. This looks like my kind of dessert Ivy! Yum! Now, I hope to have the guts to try this recipe… I have a stack of Phyllo in my freezer waiting for my command. Wish me luck! Pixen, Good luck. If you make it save it to post next month in my new event Sweet Pies. My birthday is around the corner … hitting the big 30 and i have decided to make this dessert (using your recipe) as it was by far the most memorable dessert I enjoyed in all my backpacking throu Greece in my younger days.